It’s no secret that the Hipster Walmart that is Urban Outfitters has helped bring back certain media formats from the dead over the course of the last decade. They’ve been one of the biggest factors in the rebirth of vinyl records, both as vendors of cheap, low-quality record players and newly minted vinyl LPs. But can they do the same for VHS, while charging a boatload in the process? That would seemingly be what Urban Outfitters is experimenting with, given these patently ridiculous five-packs of VHS tapes that are now available via the retailer’s website. 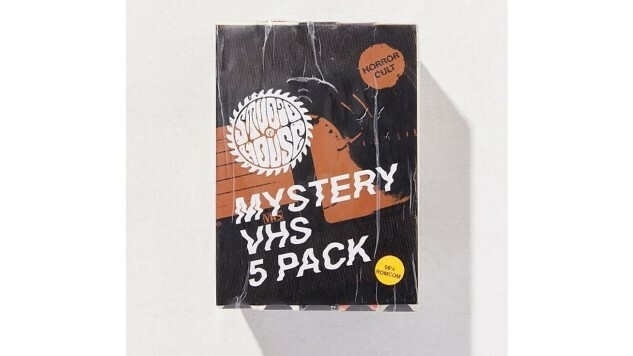 Each 5-VHS “mystery pack” is retailing for an absurd $40, or $8 per tape. Nevermind the fact that many of the same tapes can surely be found for pennies at the Goodwill down the street—Urban Outfitters demands you pay a premium for their tasteful selection of five VHS classics, most of which seem to have been culled from the pool of 1990s nostalgia. The movies are bundled into genre-based mystery packs, and the company promises that they will be “unique, iconic and will vary from what is pictured here.” That means the tapes could be essentially anything that Urban Outfitters and their partner Studiohouse Designs deems “iconic”—which they seem to think includes Children of the Corn 666: Isaac’s Return—but the company simultaneously promises “there are no duds in this batch!” Allow us to make this clear: Any batch with a Children of the Corn sequel in it undeniably contains a dud. That’s just a fact. The target audience, presumably, are hipster kids who plan to stick the VHS 5-packs on a shelf as a “cool statement piece” without ever playing them, in much the same way that my own college-aged self nailed a bunch of vinyl albums to my wall. As in my case, it’s equal parts charming and pathetic to imagine this in action, although at least my vinyl wall was made up from $1 bargain bin selections. Paying $40 for something you can find for 5 cents at any garage sale? That’s just fiscally irresponsible. If you are a human being who has actually paid $40 for one of these sets, please contact us to relate how the experience made you feel. What’s it like owning a slightly used VHS copy of Molly Shannon’s Superstar in 2019?